MSV: Anthony "Stick" Romano: "Don't read the blogs"
Anthony "Stick" Romano: "Don't read the blogs"
At the Wednesday MSTA sponsored "Hoboken Spoken" event hosted at the Elks, Freeholder Anthony "Stick" Romano was an early, featured speaker on a "fiscal administration panel." Among several suggestions and critiques, he claimed the "City makes it look like the County (HudCo) is raising taxes... it makes them look good," before adding, "The City is dumping on the County." Romano further opined Hoboken was a victim of its success and pointed to the NJ formula on county taxes as a driving reason for Mile Square residents feeling the tax pinch advising the audience, "Part of the press we have to do as a group is request the state legislature... make a change." On the subject of revals, Romano expressed disdain for any rolling reval noting the pain on some residents, "Revals have certainly hurt you," and shot down the idea offered by Joe Hottendorf earlier Hoboken should conduct them regularly, termed a "rolling reval." On the topic of rent control, Romano expressed concern about how to "grow affordable housing," but complained about people who work on Wall St. making good salaries paying low rent. "Rent control is a bitter issue.... It was never meant for people making $300,000 a year paying $600 a month." Romano did not mention his annual six figure earnings and other business interests while living in Marine View, a subsidized housing complex supporting Hoboken middle income workers. Unlike remarks he made at the Peter Biancamano kickoff where he leads the Old Guard faction vs. a Reform council ticket saying, "This is a war," the mostly realtor audience heard a kinder, more gentler Freeholder. "Stop blaming, pointing fingers...born and raised... everyone sit down... we seem to have lost respect." On the oft discussed topic of Washington Street's overdue infrastructure and repaving, Romano was more critical. "Why is Washington Street like a third world country?" He pointed to needed PSE&G and United Water work needed before rhetorically asking, "What's the solution?" Although no one asked any questions, Romano went out of his way to call out MSV early in his presentation asking for accurate reporting before later saying, "I don't read blogs... It's constantly divisive. Divisiveness has to be healed" and admonishing the real estate audience, "Don't read the blogs." How people view Hoboken was another area of interest for the Freeholder. Perhaps signaling his support of big development, he barked emphatically, "I hate when people say they want to keep the small town feel. It's a city! Not a village!" Yesterday, Mayor Dawn Zimmer issued a statement to Hudson County View on the MSTA event co-sponsored with the Liberty Board of Realtors blasting it as a "coordinated misinformation campaign." The statement also highlighted while the City has lowered taxes since 2010, Hudson County has hammered Hoboken with massive tax increases and not all due to increasing market values. The mayor also went public for the first time on a criminal complaint where she alleged a threat by Joe Hottendorf jr. to "run me over." The comment was made among a group of people on the Facebook page of Rory Chadwick, a former Hoboken resident and used boutique bag seller. MSV will have more on that story. 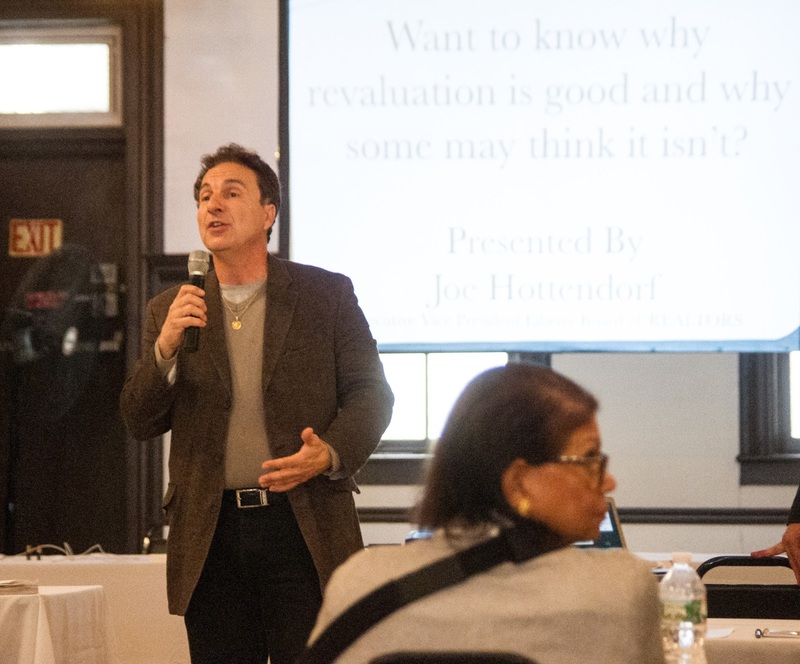 On Wednesday, Freeholder Anthony "Stick" Romano was a featured speaker addressing an audience of Realtors on issues ranging from taxes, rent control, Washington St. and blogs. Of the latter he advised, "Don't read" them. Talking Ed Note: After speaking Freeholder Romano went out of his way to come over and shake the hoof of a horse. Da Horsey quipped letting him know a thought on his presentation before he exited. Best of luck in "the war."